Chicken Lickin’ Hickory House sits humbly in the background between a couple of gas stations just off of I-95 on Exit 5 in Hardeeville, SC. Heather had to make a trip down to Pooler, GA, for some work she was helping her father with. She called to ask if she should pick up some SCBBQ on the way home. The answer, as always, was yes. From putting together the SC BBQ Map for the site, I knew that there were a couple of options in the Hardeeville area. There is Chicken Lickin’, obviously, but there is also The Pink Pig, about 8 miles from that same exit, in the same direction. 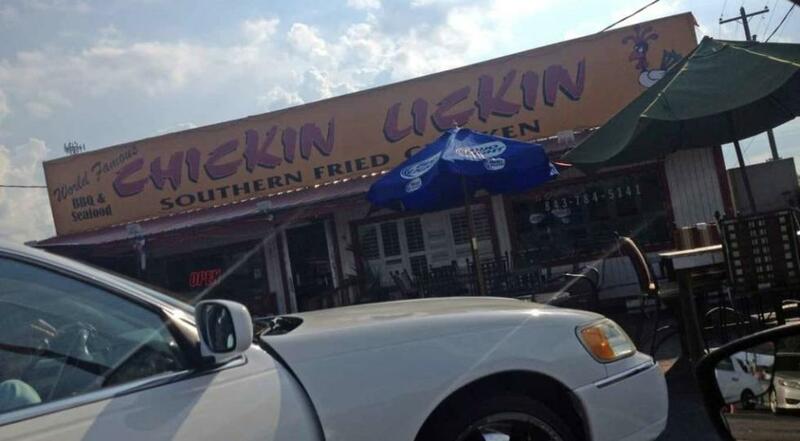 For convenience’s sake, she decided on the closer option: Chicken Lickin’. The building is eye-catching and a bit of a dive all in one, usually a pretty effective combination. The bold yellow and red sign tops a small white building trimmed in red. The pit room is to the front left as you approach the building and at times you can see the large metal pit from an open side door. The interior is small, but a couple of people were eating there. There are also a few tables outside. Heather entered and asked about the ribs. A nice but taciturn gentleman told her the ribs weren’t ready yet, despite the fact that someone was eating ribs in the dining area. She ordered a pound of BBQ to go and had them include a couple of containers of their sauce. Hungry, she also got some fried chicken and fries for the road. While waiting for her order to be complete, 4 or 5 sets of customers came and went. Clearly, they do a good business. Hardeeville is almost 2 hours from Mt. Pleasant. As we’ve said before, we would prefer to eat at the restaurant for our reviews, but that is not always feasible. I think it is a bit unfair to the restaurant to be judged on a 2-hour old product. Nonetheless, Heather arrived and we sampled. First, the thing that stood out is that the pork was chopped, not pulled. Frankly, we don’t care for chopped BBQ. It is simply not as good a product as pulled pork. The second thing that we noticed was a clear smell of smoke. This is ideal, of course. That smoke taste was evident as well. The third thing we noticed is that the pork is very fatty, at least our serving was. I noticed that reviews on other sites have complained about the same. Fatty BBQ is simply not appealing when warm. It is even less desirable two hours later when that fat has congealed and the fattier pieces return to a more solid state. I’ve said many times on this blog that I hate fatty BBQ, and nothing has changed my mind. I couldn’t enjoy the meat because every few bites I was treated to another chunk of fat. Because of this I simply cannot recommend the BBQ. The sauce was interesting and different from any other sauce I’ve tried. We had two small, plastic containers of the sauce. It was a heavy tomato bbq sauce. It was both sweet and tangy with a touch of heat. I enjoyed it and it went well with the pork. As for Heather’s fried chicken, she said the seasoning was good but that she thought it was overdone and dry. The fries were standard crinkle fries, which like most fries are hard not to enjoy. So, unfortunately, we are left with not too many good things to say about our first visit to the Chicken Lickin’ Hickory House. That said, you will find that they have a fairly good reputation on places like Yelp and TripAdvisor with many positive comments at the time of this writing. So opinions vary, but such was our experience.